This Blue Ribbon award winning pie is reminiscent of the Coffee Toffee Pie created by the 1970’s Mill Valley eatery in Strawberry called La Petite Gourmet. The small restaurant was tucked away on Reed Street and specialized in gourmet soups and sandwiches and also created this delectable dessert pie for patrons to enjoy. Coffee Toffee Pie also has its’ roots back to the 1960’s where it was served at the historic San Francisco institution on Union Square called Blum’s Bakery and Restaurant. Inspired by the rich flavors of the traditional Coffee Toffee Pie, Kimberly Jessup has brought this dessert pie back to the Bay Area and to your table for a taste treat you don’t want to miss. 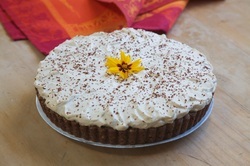 This three part pie is a labor of love that combines the wonderful flavors of chocolate, nuts, coffee and whipped cream to create “The best pie you will ever taste”. Kimberly Jessup is the pie maker and has been making folks happy with her Blue Ribbon pie since 2010. She makes her Coffee Toffee pies by night and is a second generation architect by day. Her roots are in Marin County, CA and loves traveling, sports and gardening in her free time.